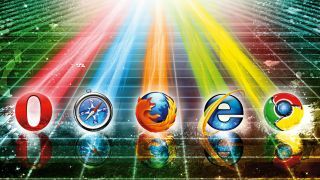 Internet Explorer has made a bit of a comeback in the last couple of years, but the UK government's own figures suggest that our home computers are much more likely to have Chrome or Safari. In an interesting blog post, Edd Sowden, a developer on the gov.uk sites, shows off a graph that shows that those coming into the official government sites through IE declines drastically at the weekend. Coupled with this, Safari and, principally, Chrome usage goes up - which Sowden sensibly concludes suggests that people are surfing to the sites from work or public PCs in the week and their own machines at the weekend. In fact, for two days a week, Chrome becomes the most used browser accessing gov.uk sites, and Safari moves into third place. It's not all bad news for Microsoft or IE, with IE9's dip considerably less pronounced that IE8 - suggesting that it's doing better at competing on home territory. Of course, the gov.uk sites are not a comprehensive sample of the browser wars, but it is a big set of users and it's another warning to Microsoft that Chrome is poised to move past it unless it can keep both businesses and the consumer happy.